Nutrition Tip: Eat Your Pulses! | What Are Pulses? Nutrition Tip: Eat Your Pulses? What Does that Mean? As of late, every time that I pull up my Facebook feed, I see an add telling me “eat your pulses.” Eat my what? I’d heard of pulses before, but if you asked me to give you a definition, I wouldn’t be able to. My inclination was that they’re some type of bean or legume. I decided to look into this and find out what pulses were and why I was supposed to eat them! Clearly, the creator of the advertisement felt that they had some nutritional benefit and I wanted to scope it out. How do pulses differ from legumes? According to Academy of Nutrition and Dietetics spokesperson, Sara Haas, RDN, a legume is a plant whose fruit is enclosed in a pod. Pulses are members of the legume family. Pulses are legumes that are harvested for seeds. The seeds, once harvested, are dried (think a bag of raw, dry beans). Based on the explanation of pulses, they’re not a new thing at all. So why am I suddenly being bombarded with a message to eat them every single time I open up Facebook? Have food scientists discovered a new benefit? Nutritionally, there aren’t new benefits, but that doesn’t mean there aren’t any benefits. Dietitians and other medical professionals have touted the benefits of beans/legumes for quite some time. In my article about vegans, I expressed that beans/legumes were a large source of plant-based protein in their diet. I’ll dig a bit deeper into the nutritional benefits later. But first, let’s tackle why suddenly pulses are in the spotlight. Apparently, we’re living in the International Year of Pulses. The United Nations was so certain of the increasing popularity of pulses, that they gave 2016 that legendary title. The purpose was to increase awareness of their nutritional value, economic accessibility, role in food security, favorable environmental impact, and agricultural sustainability. More than just a nutritional powerhouse, pulses provide a sustainable means of food production. They come from plants that have nitrogen-fixing properties, which can contribute to increasing soil fertility and have a positive impact on the environment. According to the Global Pulse Confederation (GPC), Pulse crops are one of the most sustainable crops a farmer can grow. To put things in perspective, it takes 216 gallons of water to produce one pound of soybeans , 368 gallons of water to produce one pound of peanuts and 1,857 gallons for one pound for beef. I love peanut butter and can easily go through a jar in a week if I’m not careful. Think about how often we consume products containing peanuts, the quantity of soy added to foods and the prevalence of burger restaurants! This is where pulses shine: It takes just 43 gallons of water to produce one pound of pulses. Talk about water conservation! According to the United Nations’ Food and Agriculture Organization, pulses are a vital source of plant-based proteins and amino acids for people around the world. 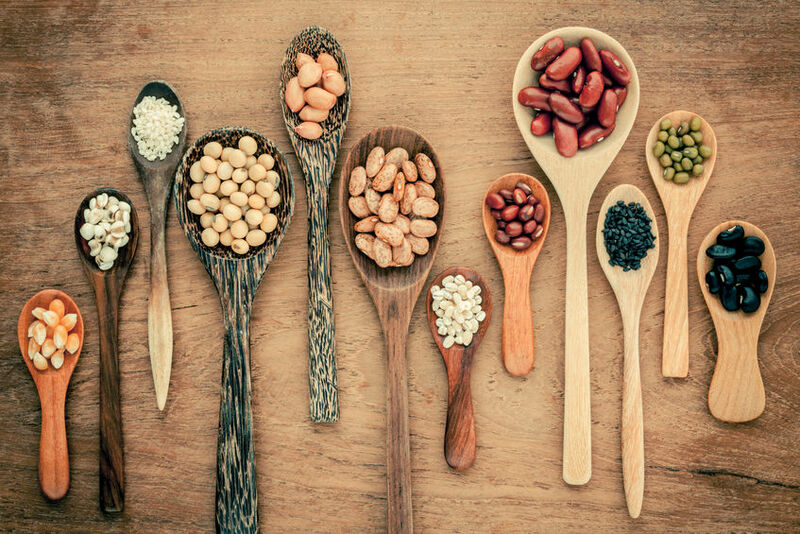 They recommend consuming pulses part of a healthful diet to address obesity, as well as to prevent and help manage chronic diseases such as diabetes, coronary conditions, and cancer. Protein isn’t the only benefit pulses provide. They also are a great source of fiber and micronutrients such as iron, folate, zinc, phosphorus and magnesium. In addition to providing an excellent plant based protein source for humans, they’re also an important source of plant-based protein for animals. The Global Pulse Confederation explained that up to 25% of pulses are used to feed pigs and poultry. Pulses have played a large role in traditional foods from India, Pakistan, the Mediterranean region and the Middle East. Pulses add variety to menus and a chance for home cooks to expand their menu options. They are a great food to have on hand because, in addition to being easy to prepare, they also can serve as a meat extender on menus (ex: adding lentils or other beans to meatloaf, taco meat or soups to make the meal go further and provided filling fiber). How should they be prepared? Pulses are available in grocery stores in a variety of forms. The most common form is ready-to-use cans. If you purchased canned versions, look for “BPA Free” on the label and be sure to drain and rinse before consuming to reduce sodium intake. A more economical option is to purchase them dry in bulk containers or pre-bagged. Pulses should be cooked before eating. Unlike dry beans, lentils and split peas do not require soaking prior to cooking. Use unsalted water because adding salt may cause the lentils to toughen during cooking. If you plan on adding tomatoes, or other acidic ingredients, it is best to add them later in the cooking process because they may slow cooking. If you have a pressure cooker, you can make your own “refried beans” and freeze what you don’t consume for later use. If you would like to help reduce your carbon food-print and assist agriculture sustainability, I suggest adding pulses to your diet a few times a week if not daily. Pulses would count as the complex carbohydrate in your meal in ½ cup cooked portions or in when consumed in 3/4th cup to 1 cup portions; they can serve as your sole protein source in a plant-based meal. The following recipes from simplebites.net provide delicious ways to incorporate pulses into your diet. Try this healthy dip with raw vegetables or replace it with mayo or source cream on a sandwich or burrito. Melt coconut oil in a large stockpot over medium-high heat, then add curry powder, garlic, and onion. Saute for about 3-4 minutes on medium heat, stirring often so the garlic doesn’t burn. Add vegetable stock and green lentils. Bring soup to a boil, then partially cover and reduce heat. Simmer for between 20 and 50 minutes (or until lentils are tender; mine typically take about 50 minutes). Serve immediately with your choice of garnish and a large salad. The patties are very flavorful, but soft in texture. Creator, Aimee recommends adding plenty of ‘crunch’ to your burger to enjoy a balanced bite with lots of different textures. Options include: pickles, lettuce, sliced onion, sprouts, cucumber and salsa – although not all at once! Put some flour in a salad bowl to use in flouring your hands and the outside of the patties. Form 1/2- to 3/4-inch thick patties. The patties might seem a little fragile, but you don’t want them too stiff or they might dry out and get crumbly once cooked. Cook in a well-greased skillet over medium to medium-high heat, or an indoor grill, for about 5-8 minutes on each side, turning at least once for even doneness. You can add oil in between sides, especially if you want a nice even browning look, or if you’re using a cast iron skillet.